The winter months are now upon us. While we’ve experienced warmer than average temperatures well into November, December is proving to be quite chilly. Now is the time to think about winter weatherproofing your home. As the cold moves in, its important to ensure your home has the proper weatherproofing. This helps to keep you warm and save on your electrical bills. Simple steps like caulking your doors and windows, adding storm windows and honeycomb cellular shades, and insulating your attic can greatly impact the overall comfort of your home. The easiest way of winter weatherproofing your home is to caulk around doors and windows. They are often the source of air leaks that are allowing air to pass through. How do you determine which doors and windows need caulking? A simple trick is to strike a match and slowly move the flame around the perimeter of the doors and windows. If the flame flickers or the smoke creates a visible trail toward or away from the window, you’ve got a leak. Be sure to cut fans off and have all windows and doors closed for this process. You may need to remove old or damaged caulking where cracks have occurred; a razor blade will do the trick. Clean the area before applying the new caulk. 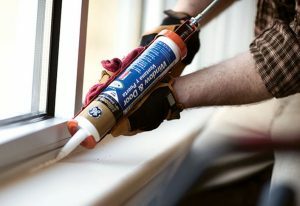 For more information on the different types of caulk, go here. Your windows are a great line of defense when it comes to keeping the warm air in and cold air out in the winter. Some additional methods of tackling winter weatherproofing your home includes adding storm windows and honeycomb cellular shades. Storm windows are an easy and lease expensive alternative to buying all new windows. They easily retrofit most old and new windows and can be installed on the interior or exterior of a window. Most new homes will come with storm windows and rather than tossing them in the attic, install them to better control the flow of air in and out of the windows. The best application tends to be installation on the interior of the window and can be completed in usually less than an hour. To learn more about storm windows, see the Department of Energy’s website here. Honeycomb cellular shades are also a great way to keep warm air in and cold air out. They also help to insulate the window frame itself. Keep the shades up during the day to allow the sun’s rays to warm up the space and lower at night to keep the cold air from penetrating the room. 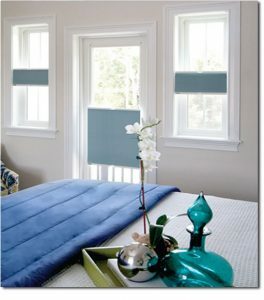 We proudly sale Norman Portrait honeycomb shades and other Norman shades and shutters. With the capacity to raise and lower from both ends, these shades provide tones of versatility while maintaining energy efficiency. To learn more about Norman Shutters, go here – or come see us! Finally, if you have an unfinished attic, insulating the attic is great way to winter weatherproof your home. Hot air rises and will escape through cracks or holes in the roof. If you want to keep your home warm and energy bills down, insulate your attic space . If using fiberglass insulation, be sure to wear proper clothing protection. Fiberglass can be very irritating to the skin and respiratory system. If you’ve got an attic or crawlspace, also consider checking to make sure those spaces are also well insulated. While this list is far from exhaustive, a few hours work can really go a long way to winter weatherproofing your home! Most of these tips can be weekend do-it-yourself projects, but reach out to experts like Southeastern Interiors for questions.